Medic chuckled as he recounted the moment. Three hours earlier, at least four gunmen and a suicide bomber had stormed 14 Riverside Drive, a leafy office, restaurant and hotel complex in the heart of Kenya’s capital, kicking off a 20-hour siege in which 21 people were killed. At 3.39 p.m. (1339 GMT), Medic, the 56-year-old Swiss founder of a private security firm, was on his way home from work in a taxi when he saw injured people being carried along the side of the road. “Seems to be an attack of some sort. Heavy explosions and gunfire,” one message read. Medic turned the taxi around and headed towards the complex, a plush regional headquarters for international companies such as Colgate Palmolive, Dow Chemical and SAP. As the car hit traffic, he grabbed his khaki emergency bag and ran the remaining 500 metres towards the billowing black smoke and the sound of gunfire. Entering the compound, he joined forces with two Kenyans in civilian clothes, each carrying a 9mm carbine and a shotgun. Medic drew his pistol. The motley volunteers were the first rescuers on the scene. At 3.59 p.m. they made their way past three burning cars and discovered the glass facade of I&M Bank riddled with bullet holes. “Somewhere in my mind, I hoped that it was just a bank robbery gone wrong, because bank robbers, after all, are more reasonable people than terrorists,” he said. 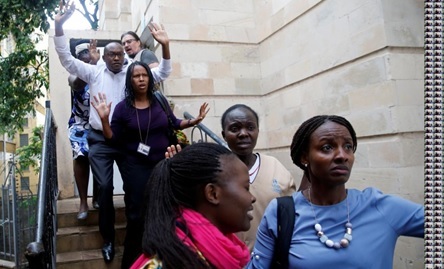 Rounding the corner, they heard gunshots from the direction of the dusitD2 hotel and paused. When the gunfire stopped, they moved slowly towards the hotel lobby, checking for ditches to dive into in case of a grenade attack. On the path they discovered a severed arm belonging to a suicide bomber who, half an hour earlier, had detonated his vest outside the Secret Garden restaurant. “I remember vividly it had a shiny ring on one of the fingers,” Medic said. As they walked over the shattered glass of the hotel’s front doors, Medic worried about a new threat: booby traps. Then they came under fire from automatic weapons. “We were sitting ducks,” Medic said. He fired two shots as the group lay down suppressing fire and, one by one, ran back to their position behind the bank. By now a mix of Kenyan security teams had arrived, along with several other armed civilians. With the number and location of attackers still unknown, Medic joined a dozen maroon-bereted policemen in securing an adjacent office block, the Arlington building. They swept from floor to floor, kicking down glass doors and evacuating dozens of terrified office workers, coaxing them out from their hiding places under desks and in cupboards. On the fifth floor, they found the office to Pernod Ricard, a French drinks manufacturer, protected by an impenetrable metal door. A voice from the other side refused to unlock it. Medic tried wrenching the handle but it came off in his hand. Eventually, the person on the other side relented. Cowering behind them were 20 or 30 employees. Medic helped them out of the building and, with the dying of the light, the U.S.-trained commando unit known as SPEAR arrived and sealed the area off to civilians. That’s when Medic’s children started calling and bombarding him with messages.